Maybe this has been posted before. Though I have not found it. Can every one be honest and answer. 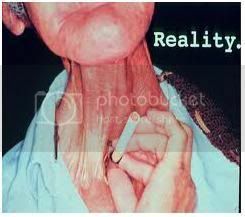 If you have ever had any pain you believe is a result of your VNS and you are or were a smoker. Just say yes or no. Or if you have an opinion lets hear it. Yes Birdbomb, rock the boat, slap the oars on the water and get evey one soaking wet. Take off your life jackets and water wings and tip the boat over!!! Take care of yourselves. Suspender!!!!! I jumped off the VNS boat a looong time ago, right before CYBX began their slow sinkage. The device is mainly being pimped for Epilepsy now and they thought they were going to become gazillionaires over VNS for TRD. Anyhoo, in regards to smoking and VNS--per my medical records and I'll throw in personal opinion too--smokers should not be candidates for VNS. Both ciggys and VNS cause throat, lung and cardiac probs. A person who smokes should be required to quit prior to implant because of the probs both cause. Heck, I have a gait disorder (caused by a cerebral incident related to VNS) and I lost my balance and ended up breaking my left foot and several toes this past November. Well, my foot healed in the broken position which now requires surgery and sitting in a wheelchair for awhile BUT my foot surgeon will not operate until I quit smoking ciggys. I've about finished my quit session so I can get my foot fixed and out of the drop foot position again. Long winded point is...VNS and smoking is no bueno and both together could pose a greater potential for side effects and adverse events. It's awesome that some folks are able to tolerate the trade offs with VNS. Like our Moderator Oreo--she has been able to find herself a happy medium with her side effects and benefits. I used to smoke many years ago but quit. I had quite a few problems with my vns.